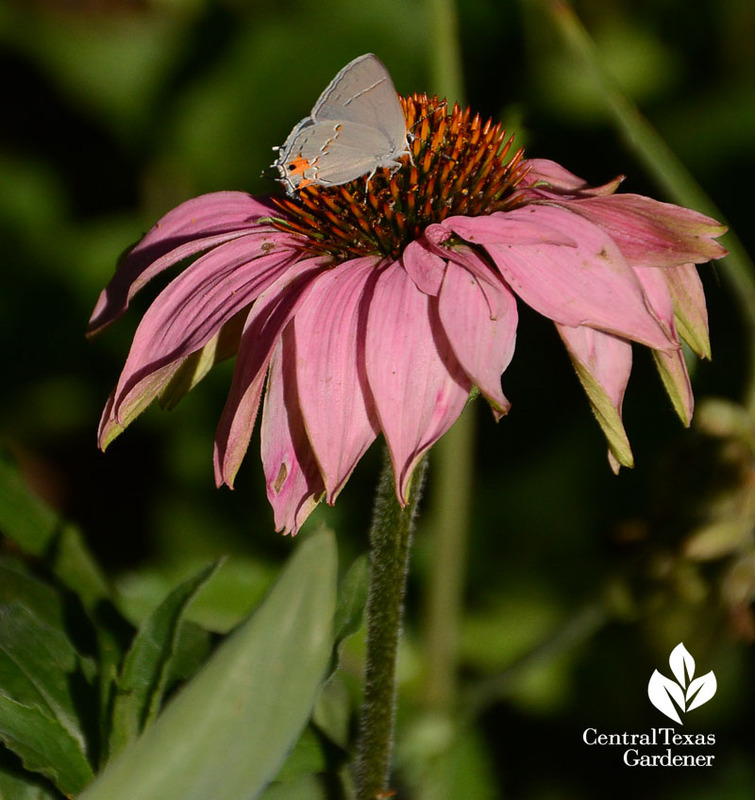 Just because flowers don’t look that great to us, they’re still tasty spots for pollinators to grab a bite, like this Gray Hairstreak butterfly on tattered coneflower. I left a thistle in this bed since bees found something to eat in the morning. 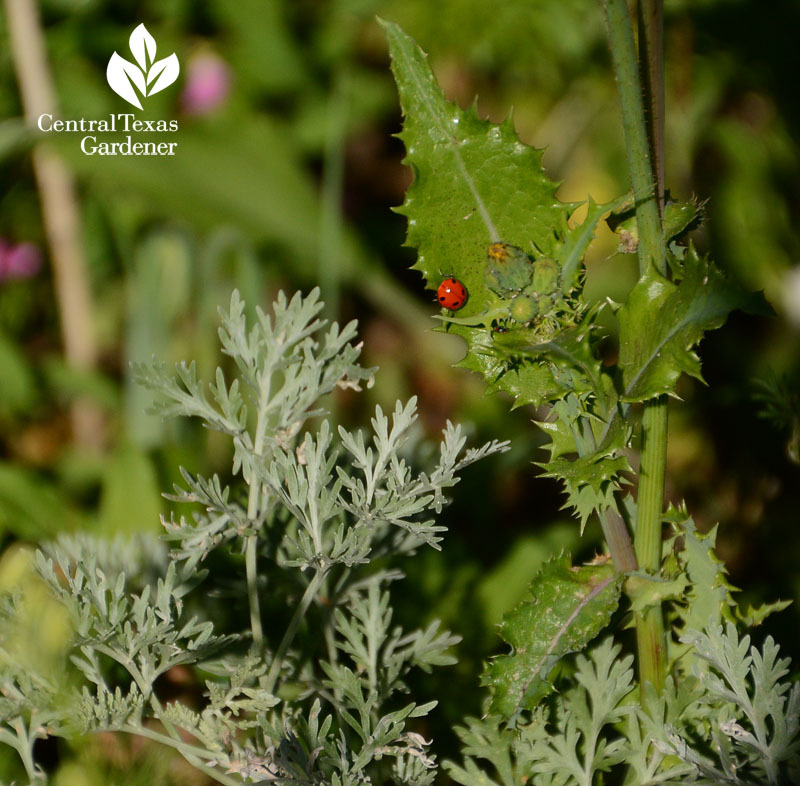 In the afternoon, a ladybug showed up to dine on aphids. 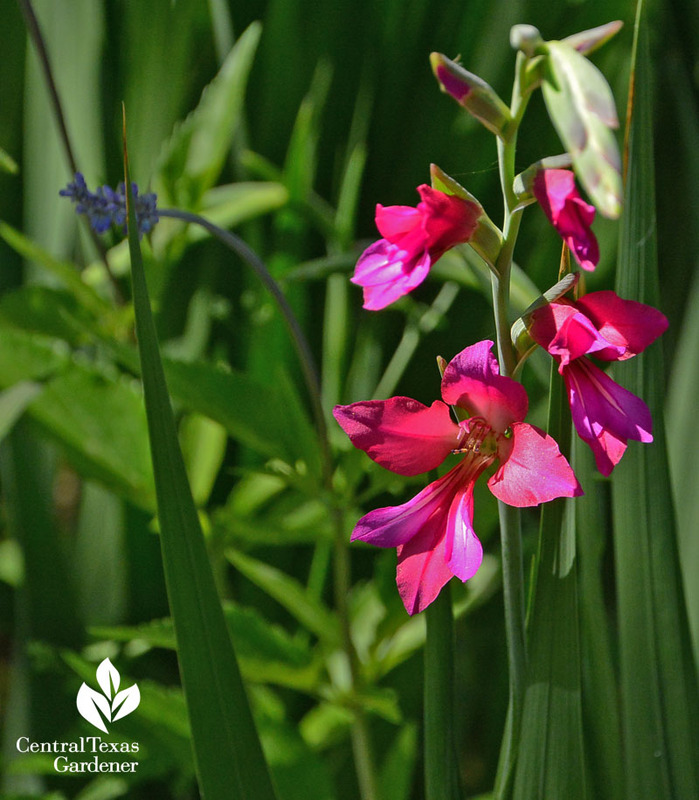 Byzantine gladiolus never fails to enchant April, joined by ‘Henry Duelberg’ salvia in the background. 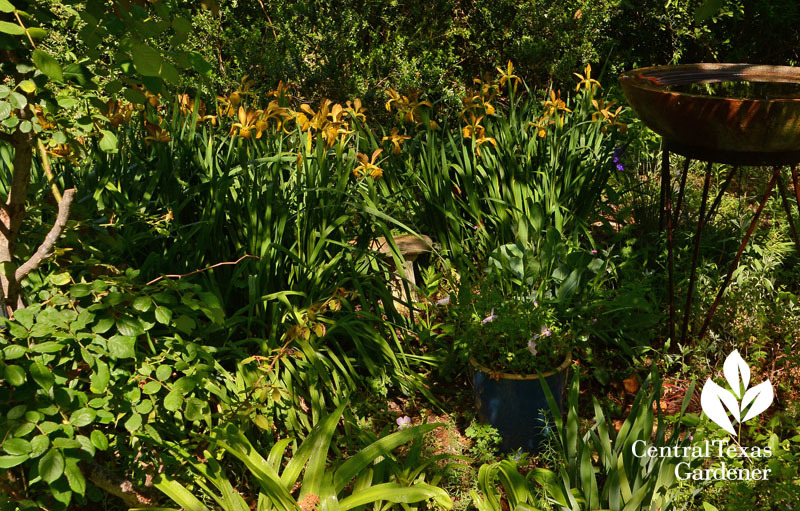 Lofty spuria irises only frame garden sections seven or so months a year from their emergence in fall to yellowing stalks in June. I cut them to the ground then. They’ll poke back up in November. 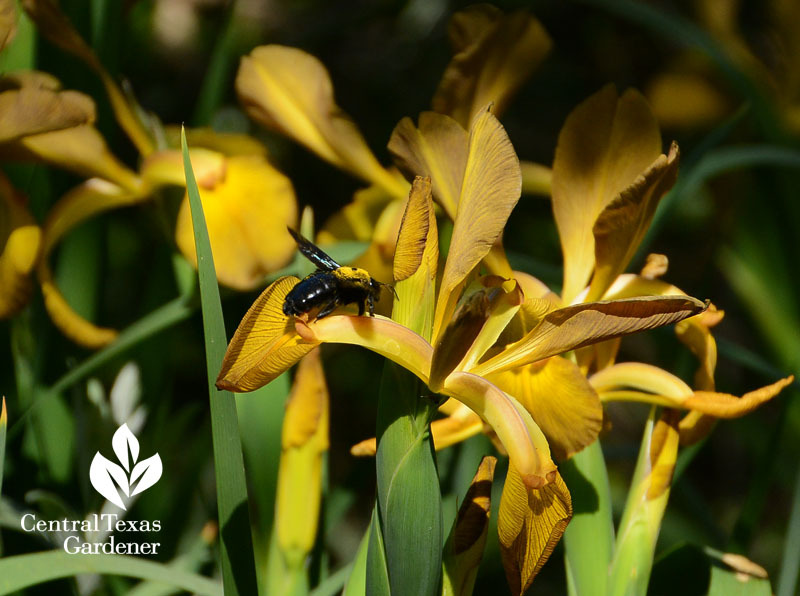 April’s golden flowers top things off with lots of bee and wasp action, including a visit from a carpenter bee. 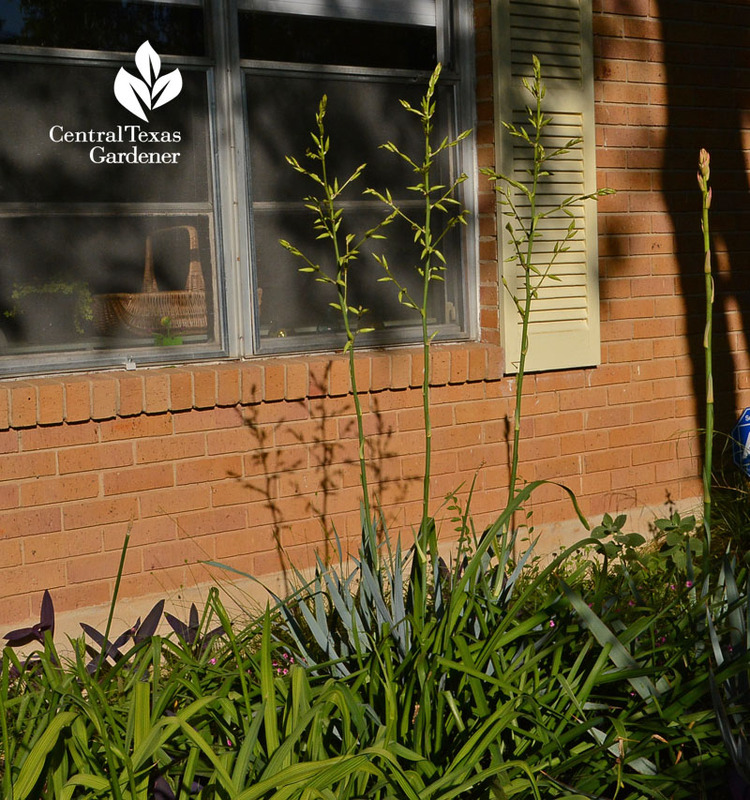 My Yucca pallidas are aiming for glory, though they won’t die after flowering! I can’t get you a great picture because in evening, it’s high-octane sunlight, and when I’m home weekend mornings, it’s a shady sort of photo “blah” to the camera. 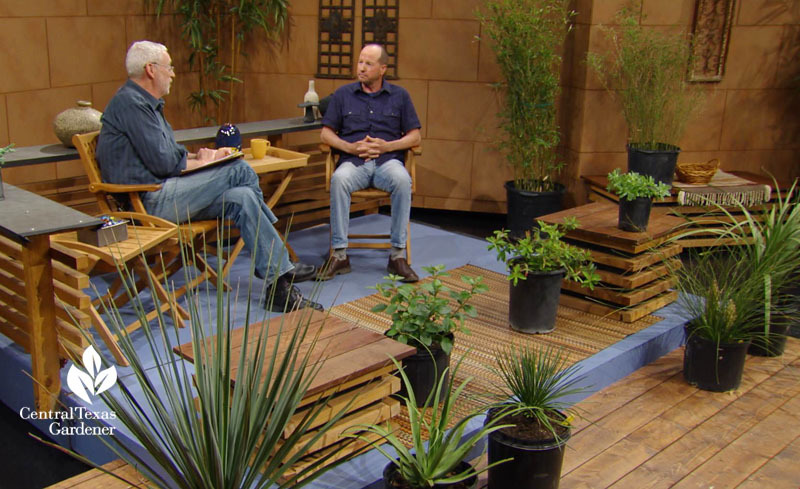 Passionate horticulturist Tim Kiphart from wholesale nursery and grower Far South Nursery has just the ticket for structural plants that work in those shade-to-sun swings. 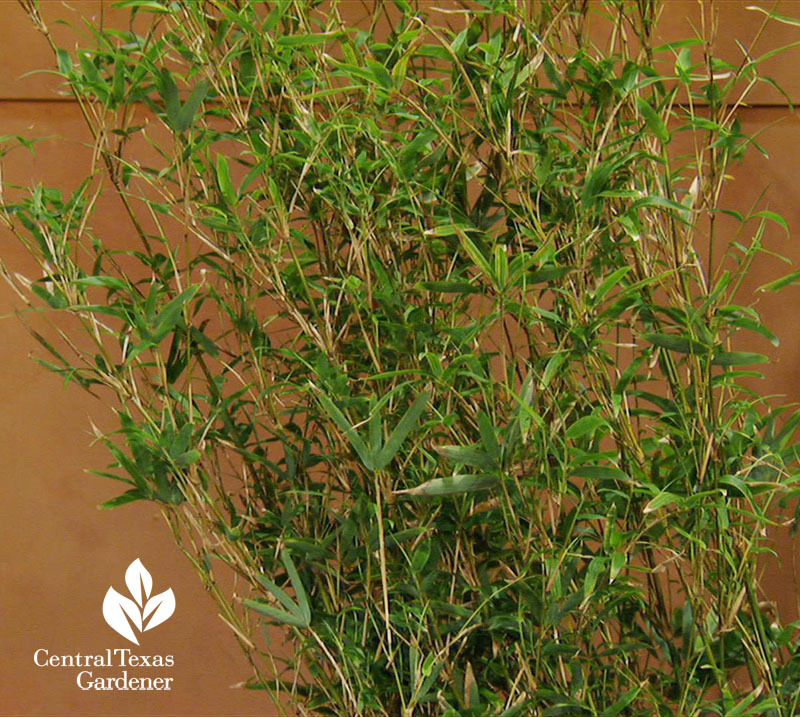 For screening, he brought along a couple of clumping bamboos, including ‘Golden Goddess’ that grows 8-12’ tall in part sun or bright woodland shade. 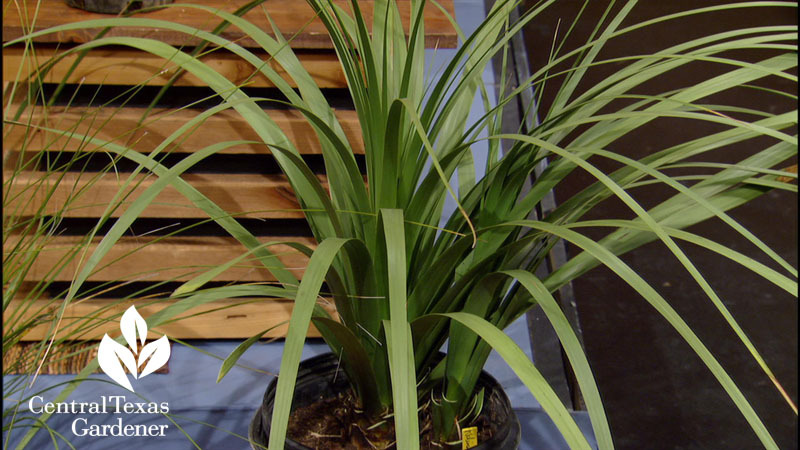 Tim details a few nolinas, too, including broad-leafed Nolina hibernica ‘La Siberica’ that eventually trunks to 6-20’. “Eventually” is the key word for this slow-grower. 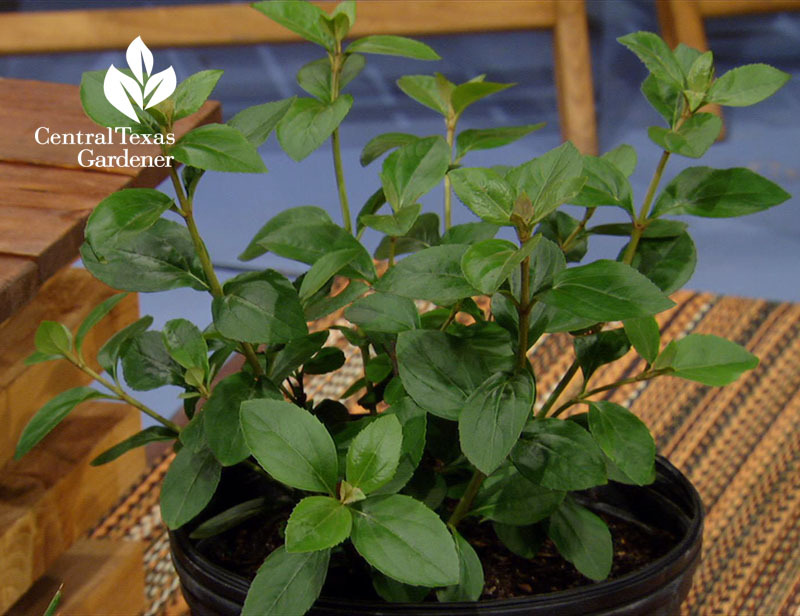 Viburnum-leaf boneset (Ageratina viburnoides), formerly Eupatorium and often found under that name, is a 3×3’ evergreen shrub in sun to part shade. Tim’s got lots of choices for you, including a hardy sedum for part sun. Watch now! I’ve seen this countless times and I bet you have, too. 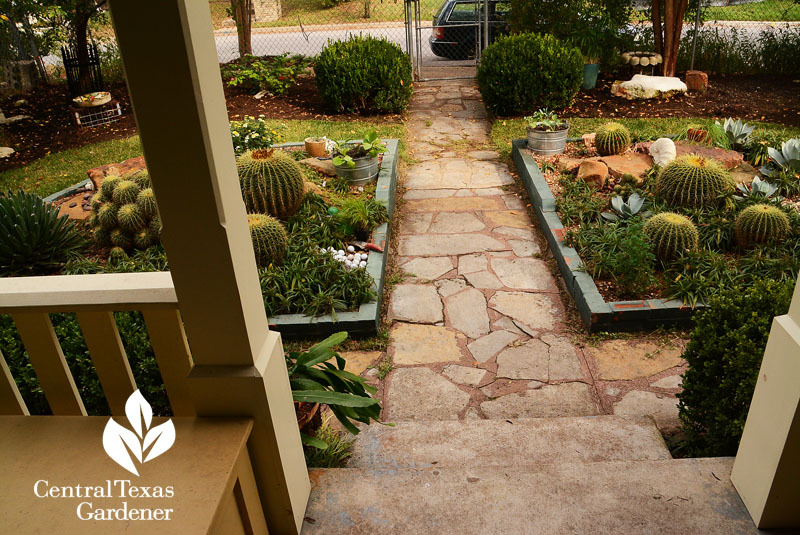 Same yard, yet one tree one is troubled while the other thrives, like these live oaks that John Thomas keeps watered and maintained. The root of the problem is complicated. Daphne explains how to test for soil compaction but ultimately, valued trees need consultation from a certified arborist. 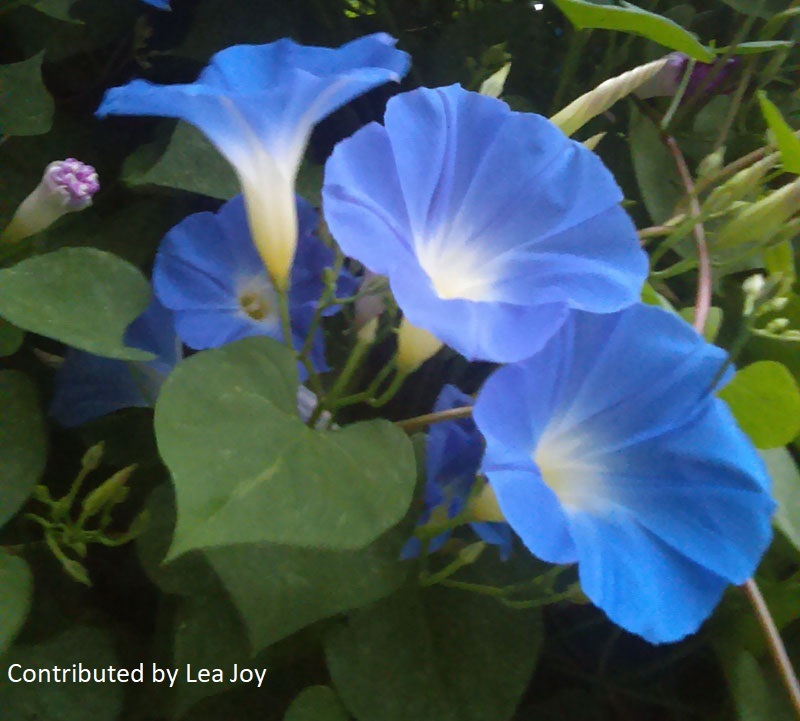 Get Daphne’s answer and Lea Joy’s tips for growing pollinator-beloved summertime morning glories. 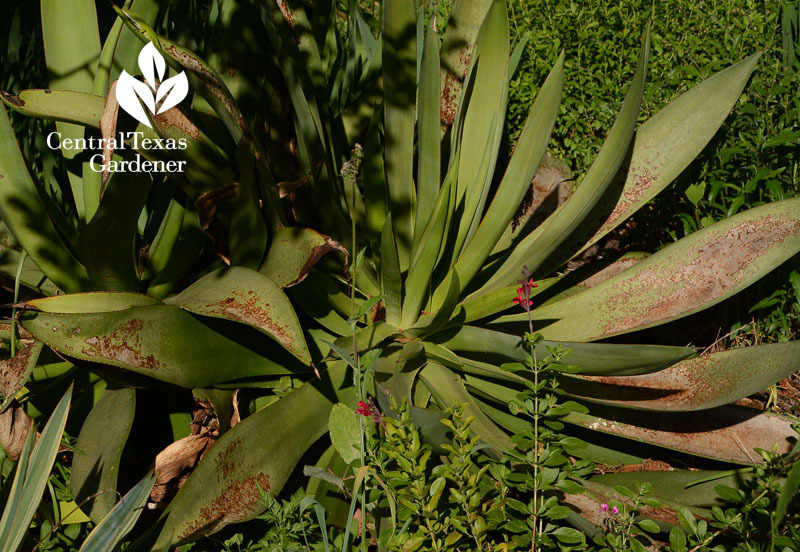 Agaves can take a hit from cold or other trauma. 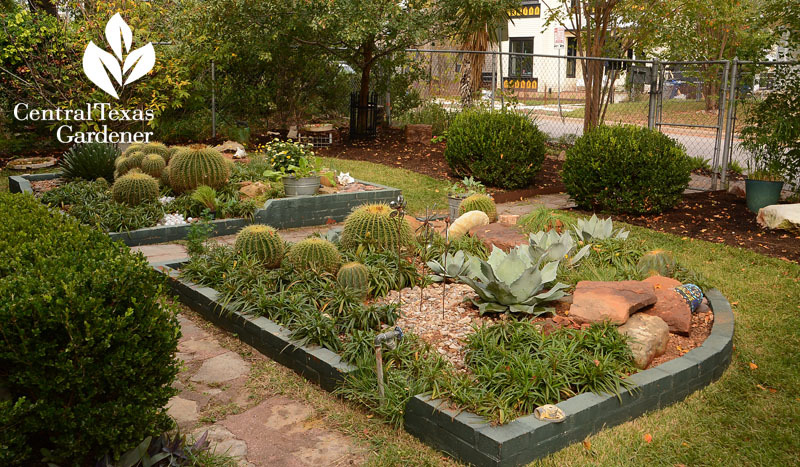 My Agave celsii is chugging away on new growth, but this weekend, I’m donning long rose gloves to pretty it up. 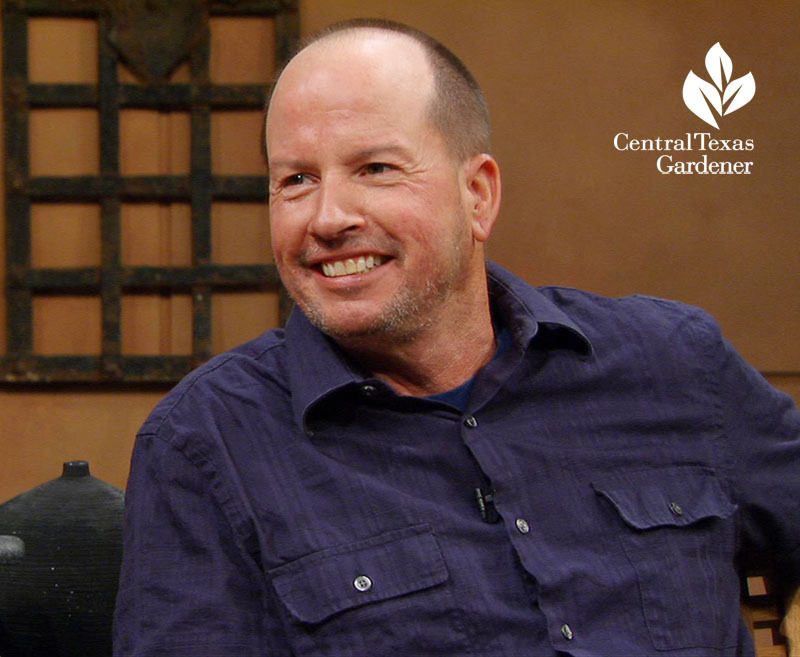 Jeff Pavlat from the Austin Cactus & Succulent Society doesn’t bother with gloves! 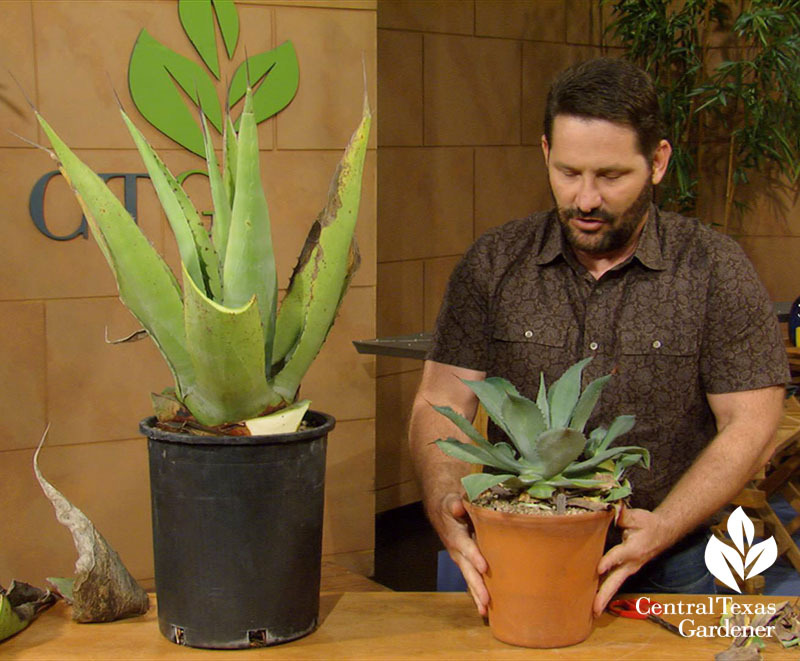 He demonstrates two techniques to clean up agaves damaged by cold or lack of water (yes!) and explains why it’s okay to leave damaged bottom leaves alone. 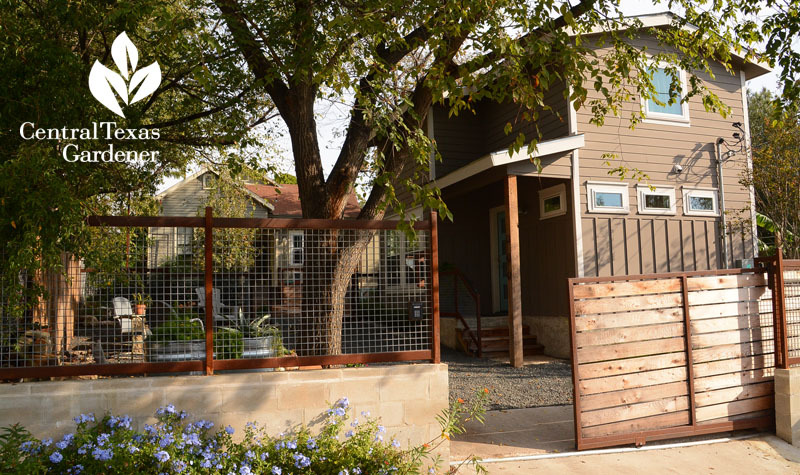 In 2003, when Briana Miriani and Mark Biechler settled into an elderly east Austin bungalow, they put their backs and sustainability creativity into its restoration. 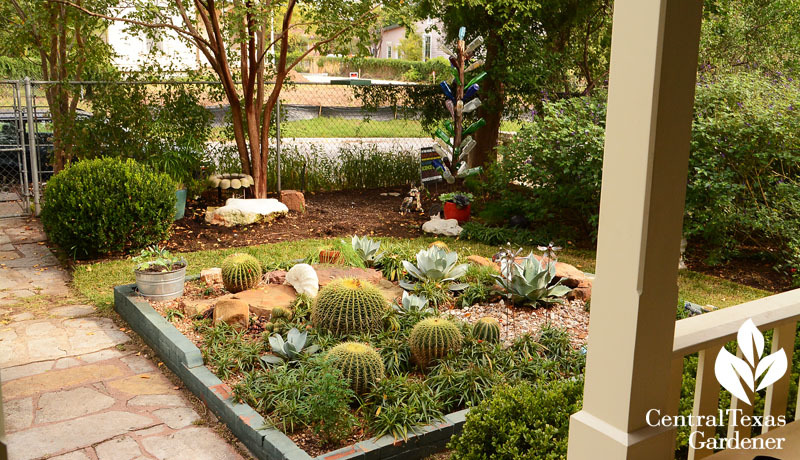 First, they gave their small front yard visual scope with geometry diversity. 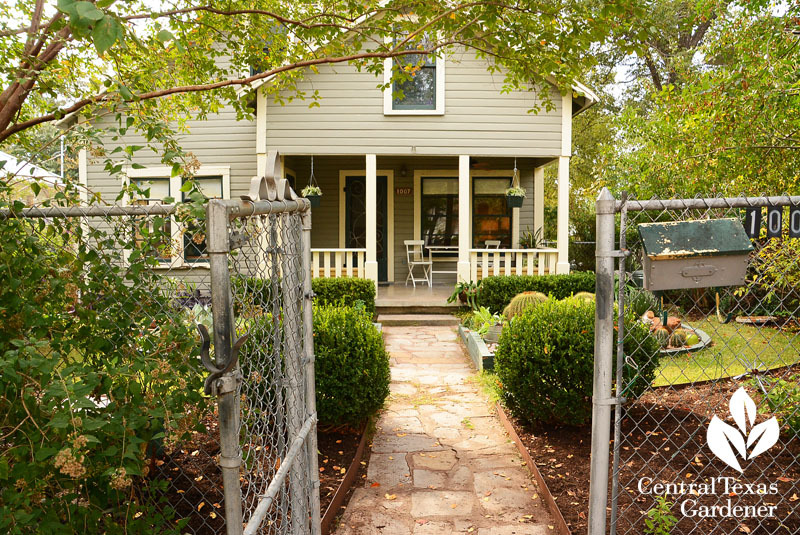 To echo the lines of the fence and house, they laid straightforward flagstone pathways. 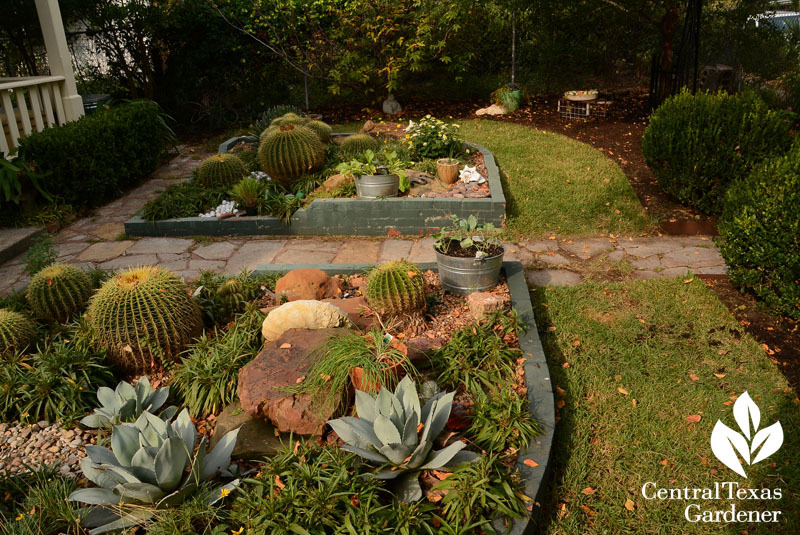 Mark offset the rectangular yard and chain link fence with curving beds and narrow strips of Palisades Zoysia. 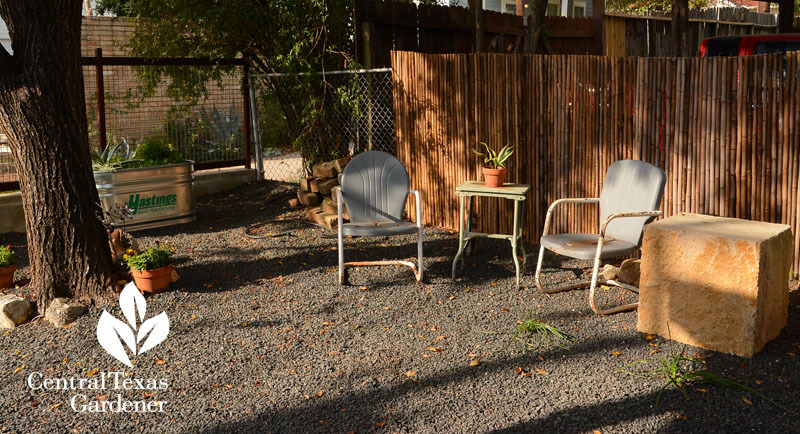 Rather than hedge out the neighbors, curving fence beds alternate screening plants with breezy views. 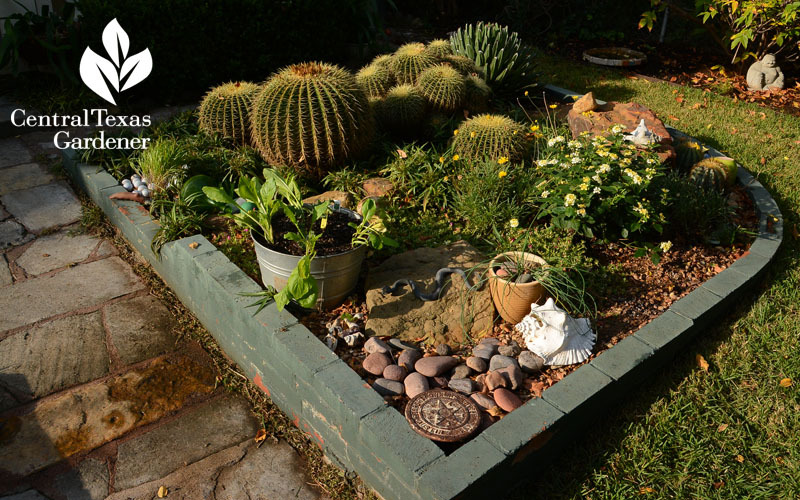 Their raised bed design brings together both contours. Graduated levels of old bricks, given a paint brush facelift, frame shapes of all kinds. 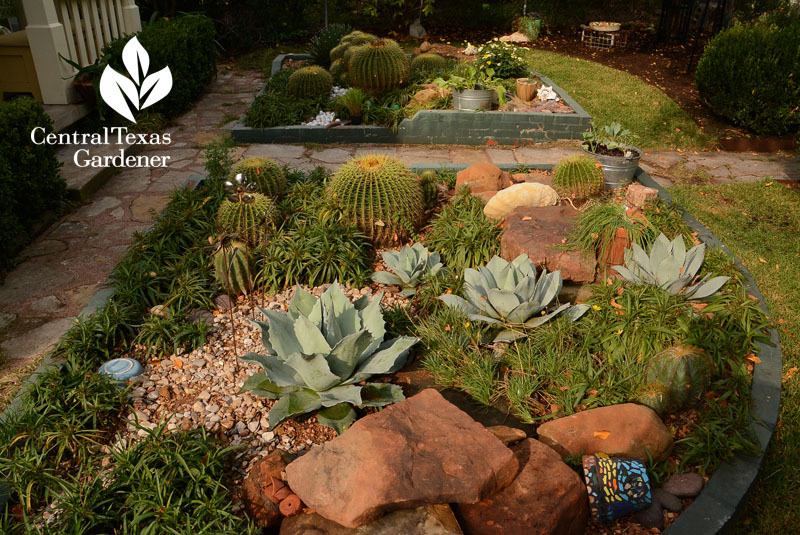 They tucked foundling trinkets and rusty-hued small boulders among agaves, rotund golden barrel cactus, and flowering perennials. Even edibles get a spot in repurposed galvanized buckets. 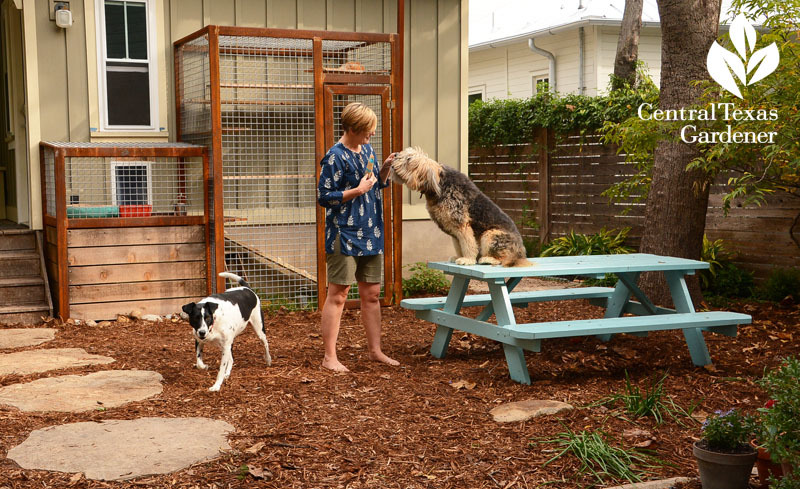 Since they’re both into animal rescue, they made the shady backyard pet-friendly. Between shade and two energetic dogs, grass didn’t have a chance. 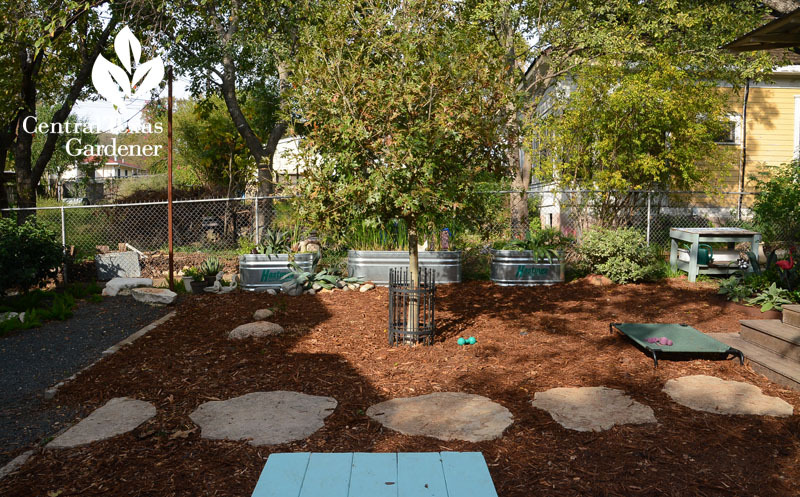 Instead, they laid a few inches of spongy mulch. 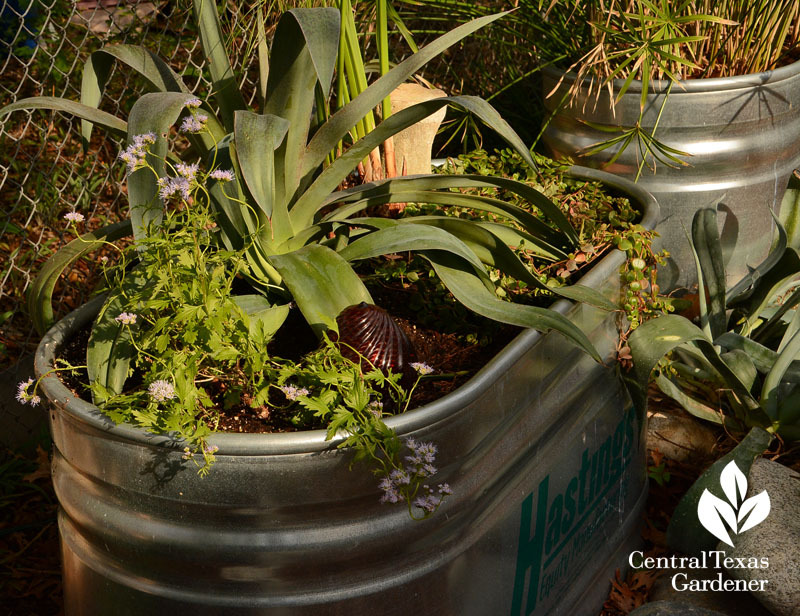 Since the fence is naturally dog-patrol ground, plants get safe quarters in a row of galvanized stock tanks. 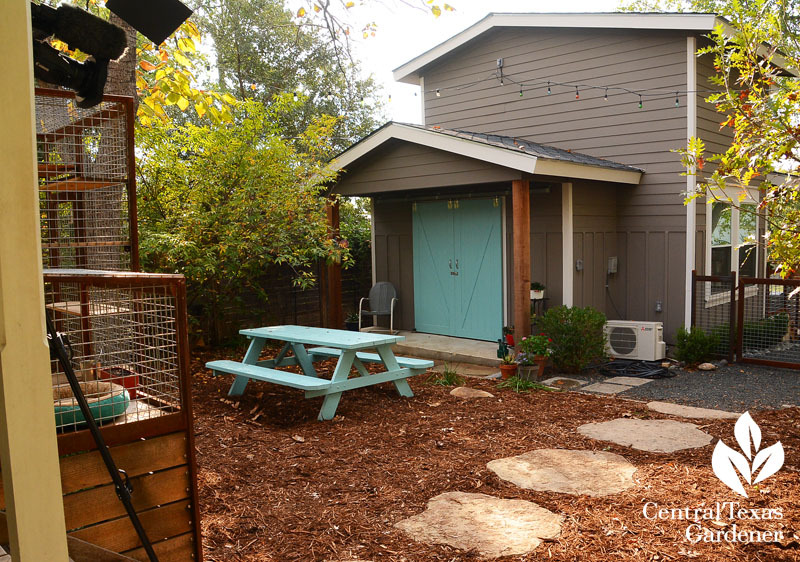 The house is small, so Brie and Mark built a guest house for family visitors and Airbnb (and a cute shed for themselves). 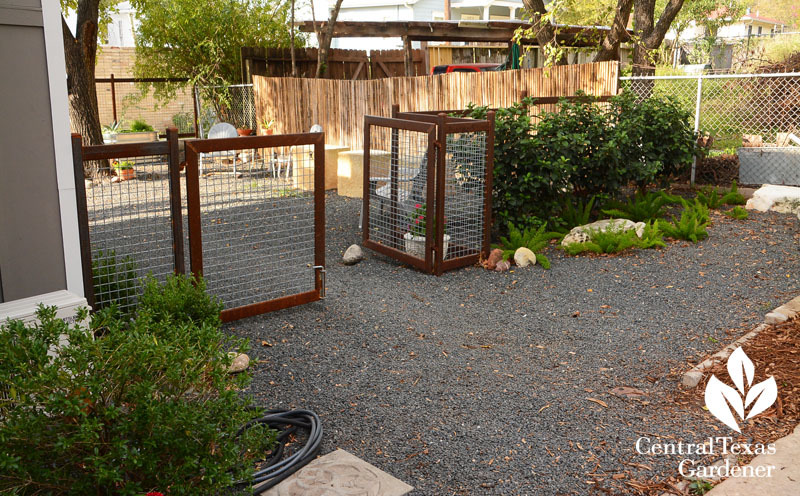 A metal-framed, cattle-panel fence and gate separates the playground from the guest house patio. 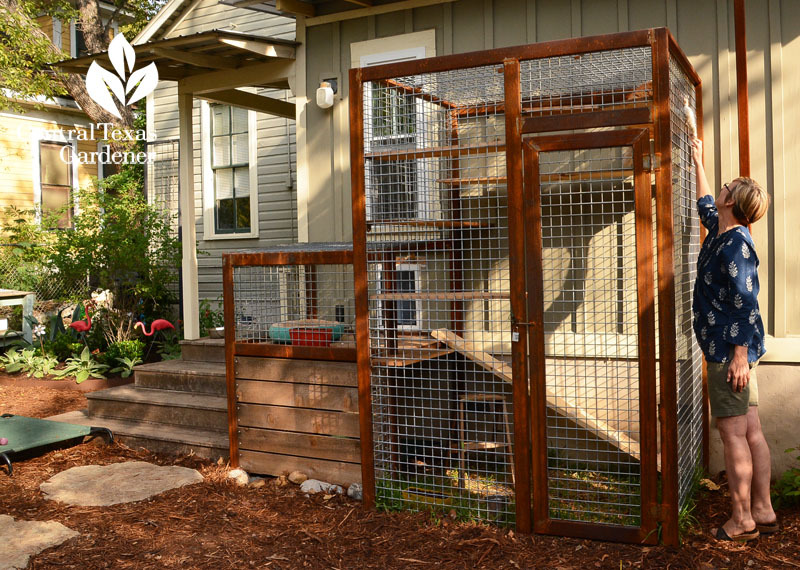 Their most recent project is a catio to give their rescued feral cats access to the outdoors while keeping them (and birds) safe. 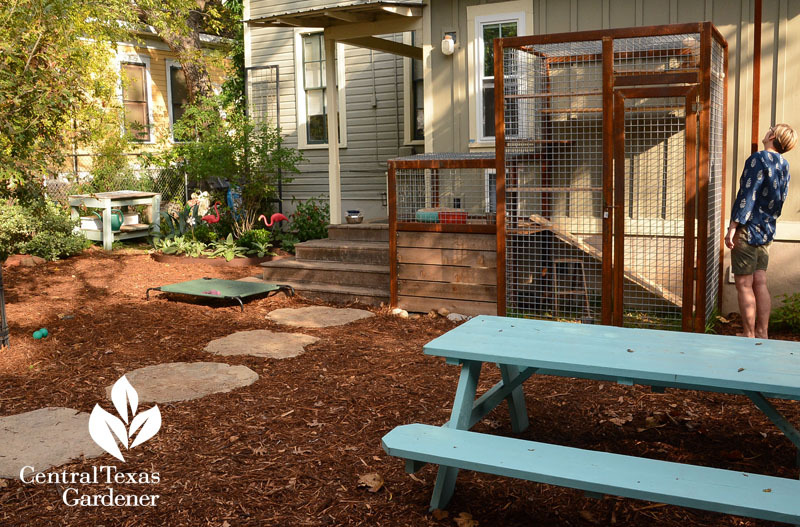 When Brie and Mark moved in, the neighborhood had a large feral cat population. 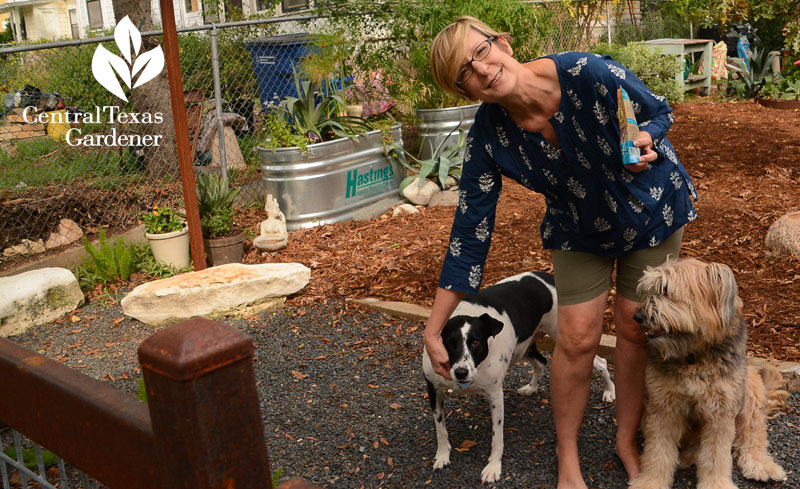 Brie and teams of others have utilized the Austin Humane Society’s free neuter/spay program. 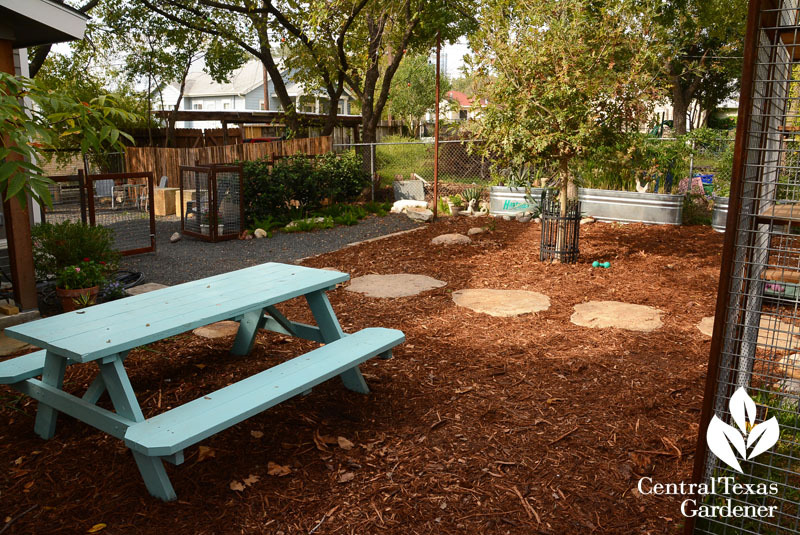 They’ve found homes for many of them, including the four that moved in with them. 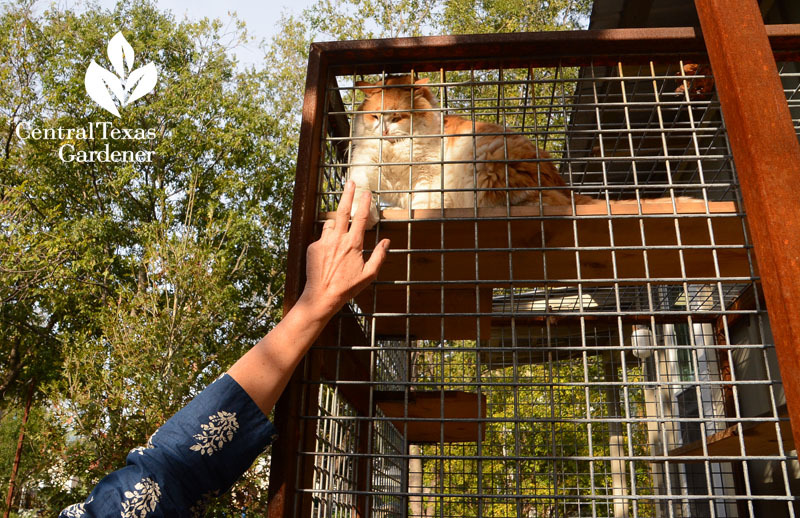 In recent years, across the country, the Audubon Society has conducted catio tours. I haven’t found info yet for a 2018 Austin tour, but I’ll keep you posted! 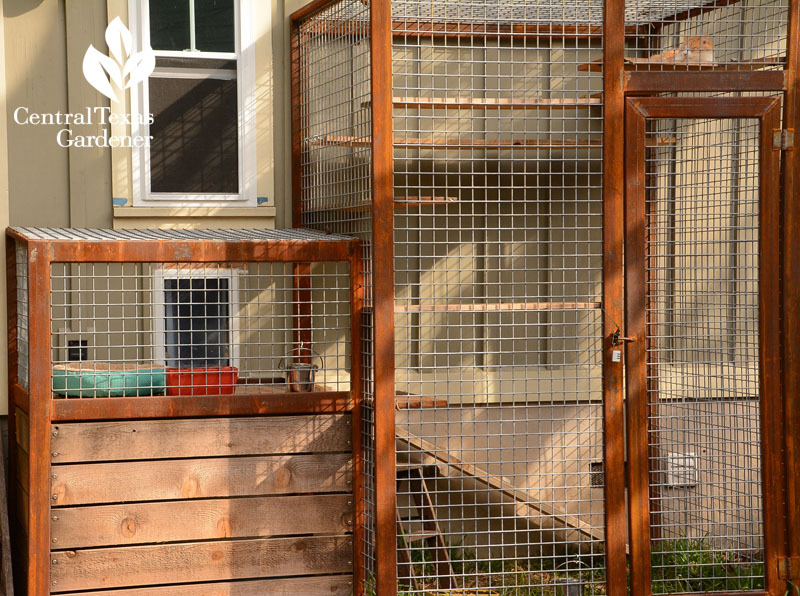 They designed their metal-framed catio to match the fence and gate. Inside, they experimented to achieve the perfect shelf levels for jumping and resting, including a shady hideout underneath. Brie advises researching cat doors for long-term durability and a heavy-duty flap to keep conditioned air in the house.